It was 80 degrees that weekend, but it was the only weekend we had free this month, so we battled the heat, crowds and sweat to pick our fall apples. We got there late (11:30a), because when you have kids anything past 9am becomes late to you. And so there was a mile of traffic, because in new york, there's traffic to any family fun location. So after parking a football field away from the orchard, we trekked to get our apples. We had our tradition Harbes Farms lunch of hot dogs and butter dipped corn on the cob, then proceeded to into the orchard, apple totes in hand. We like this farm mainly because the trees are small, which is perfect for the little ones. The kids ran up and down filling their bags and before I knew it I had 4 full bags of apples! Now carrying them back to the car was a whole other story, between the sore arms and emergency "I need to go potty!" moments for BOTH kids while walking... no...now it was running back to the car to ensure there were no accidents in the middle of an orchard. We were spent! Who's idea was this anyways? Oh yea, me and my maternal urges to have forced family fun. Well it all worked out because I was able to make a ton of apple goodies. 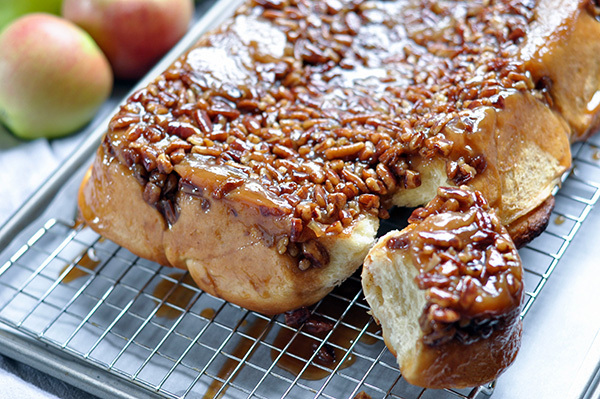 So if you have one apple dessert to make this season, these Salted Apple Cider Pecan Sticky Buns are it. They start with my favorite milk bread dough. Honestly at this point I don't really want to bake bread without this dough. Between being easy to mix and baking up super fluffy, there's really no reason to make any other bread. Once risen, I rolled the dough out to a thin, very large rectangle. Then it's time for the Schmear. Spread the softened butter all over then sprinkle the cinnamon sugar and finely diced apples all over the surface. This gets rolled tightly into a log and cut into 4 inch rounds and placed onto of a sinfully good salted butter "goo". The rolls are allowed to rest for another hour. Once puffy, these get thrown into an oven for about 40 minutes. Once golden brown, allow to cool for 10 minutes then flip these babies over! Let that gooey pecan mess drip all over the sides and dig in! The salted butter in the "goo" helps balance the sweetness of the filling and sticky caramel and it inevitably becomes highly addictive. Just a warning... you will eat more than one. To make the goo: In a medium saucepan, melt the salted butter over medium heat. Whisk in 1 1/2 cup brown sugar until the sugar dissolves. 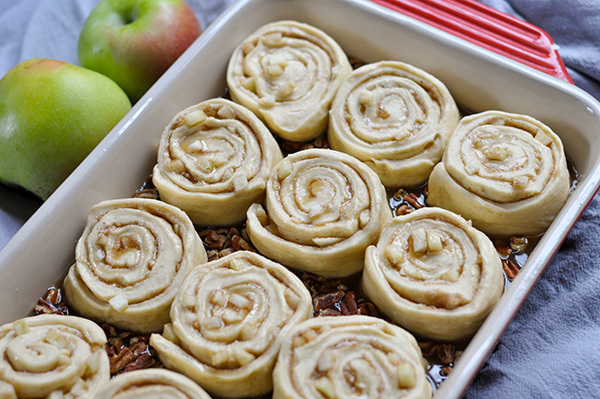 Remove from the heat and whisk in the honey, cream, and apple cider. Let cool for about 30 minutes, or until cooled to room temperature. Pour the goo into a 13X9 inc baking dish and top with pecans. 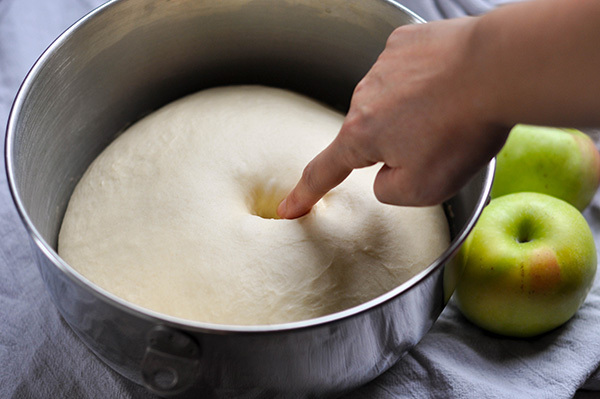 Once the dough has rise, punch it down to get out all the air. Roll the dough out into a large rectangle about 24X16. 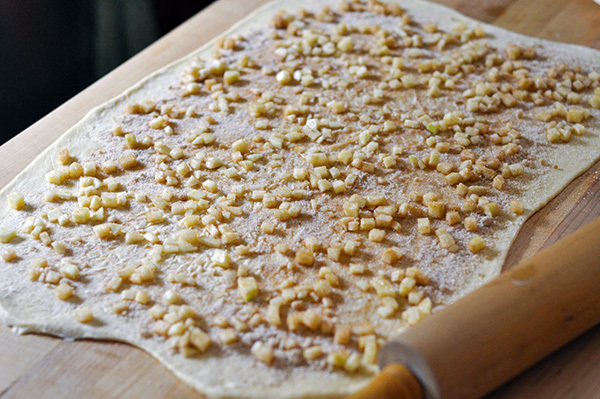 Spread the softened butter across the top of the dough and sprinkle with the cinnamon sugar mixture and diced apples. starting on the long side of the rectangle farthest from you, begin the roll. Roll tightly as you can. Cut the rolls into 4 inch rounds.Place on top of the goo. cover and allow to rise for 1 hour.